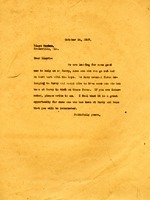 In this letter Martha Berry thanks Mrs. Townsend for letting her visit and see her gardens. 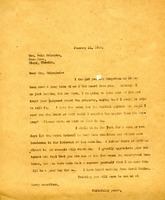 In return, she sends Mrs. Townsend some information about the Berry Schools and invites her to come and visit. Miss Berry discusses the beauty of Mrs. Stotesbury's gardens and the enthusiasm she has for her own gardens. E.O Pangle asks if Martha Berry is interested in purchasing what is known as "The Mitchell Farm." The land is adjoining to Rome property that Martha owns. Mr. Milam offers Miss Burkert a house he has for sale close to the main businness section of Rome. 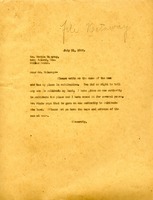 Martha Berry writes to Newton Halaway seeking the identity of a person who has begun to cultivate land owned by Berry without her permission. Fuller indicates that he has 418 acres of land to sell adjoining Berry's property. 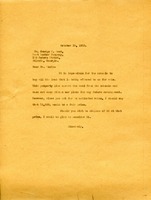 Martha Berry's letter to a tax collector with payment of personal property tax includes a reply from tax assessor with instructions for future payments. 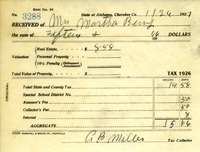 The document also includes a receipt of Martha Berry's payment. 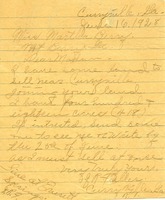 This is a letter asking Martha Berry how much tax she has left to pay. 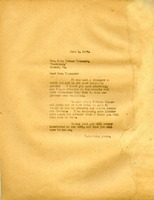 This is an letter promoting a job at The Berry Schools farms for former students. Martha Berry tells Mr. West that it is impossible for the schools to buy the land being offered to them, due to the land being across the road from the schools. The land is not in any plans for future development. However, she gives the land an estimate of $5,000 and says that if he wants to sell for that price, she would reconsider. Mrs. Nail, overhearing that Martha Berry wishes to buy a portion of her property, describes the land in which she is willing to sell. 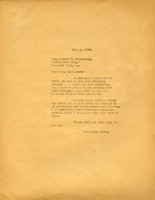 In a subsequent letter, Miss Berry explains to Mrs. Nail that she will not be able to come see the land unless the price is reasonable. 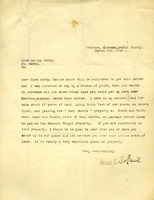 Miss Berry tells Mr. Nail that she is not interested in buying the land at his price. 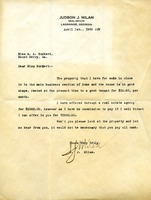 Martha Berry thanks Mrs. McLendon for the business advice regarding the sale of some property.